Lancashire’s 20mph zones are still going under the police radar almost seven years after they were brought in. Not a single speeding ticket has been issued since Lancashire County Council first introduced the restrictions across the county in 2011 in an attempt to make residential streets safer. Blackpool had already introduced 20mph limits by that time. The Gazette highlighted the problem a year ago and at that time police warned they would prosecute if their policy of ‘engagement and education’ was not working. But a year on, the force has revealed there have still not been any penalty notices dished out to drivers for breaking 20mph limits. Lancashire Police insist they are ‘not complacent’ about road safety –but with limited resources, it is simply a matter of ‘priorities’. Only last year, Blackpool Council extended a 20mph zone near Blackpool Victoria Hospital with the almost unanimous support of residents. However, some parts of the Fylde coast have seen residents complain that the speed restrictions continue to be ignored – with calls for more enforcement action to make motorists take notice. Despite the lack of tickets issued for speeding in 20mph zones, the lower speed limits have previously been credited for helping reduce the number of accidents in Blackpool. However, the number of people killed or seriously injured on the resort’s roads rose in 2016 to 85 - having dropped from 73 in 2013 to 51 the following year. Village 20mph road signs. Freckleton. Yet, despite seeing an increase in 2016, the total number of casualties on Blackpool’s roads – 563 – remains lower than in 2013. Lancashire has spent more than £9m on scores of 20 mph zones, mostly in residential areas. Critics say that, considering the cost, motorists should be brought to book if they ignore them. Yet when an e-petition was launched in the summer of 2016 calling on police to start enforcing the law, only nine people signed it in six weeks. 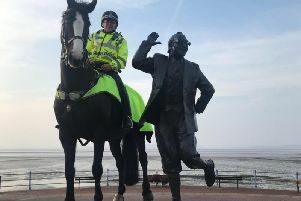 Last December a spokesman for Lancashire Police confirmed: “Engagement and education is key to ensuring that the public fully understand our work in this area. Twelve months on the force issued a strikingly similar statement saying: “Where engagement and education does not work, we will consider prosecution, but our ultimate aim is to keep everyone using the roads in Lancashire safe and to deal with incidents proportionately. The latest statement went on: “Fortunately only a minority of collisions in Lancashire happen within these 20mph zones. “We continue to work in partnership with the council and with our residents to identify those areas where they feel road safety is an issue. “Due to the limited resources we have available, we have to prioritise where and how officers are deployed in order to maximise our efficiency. “Deployments and tasking of road policing assets focus on collision hotspots where there is a frequent occurrence of serious injury, vulnerable road users or an increased link with criminality in the area. “Engagement and education is key to ensuring that the public fully understand our work in this area and so that motorists are aware of the dangers around the ‘Fatal 4’ that persist in causing death and serious injury. “These are drink driving, speeding, seat belt wearing and mobile phone use. “We continue to run schemes like Schools Road Watch and Community Road Watch and work alongside the council to place speed indicator signs in any 20mph zones where further activity is required. We also work with the council to look at engineering options and traffic calming measures to gain habitual compliance in 20mph zones which we find become self-enforcing.